Most people are surprised to learn how much their sterling silver flatware is worth. Do you have some silver flatware to sell? 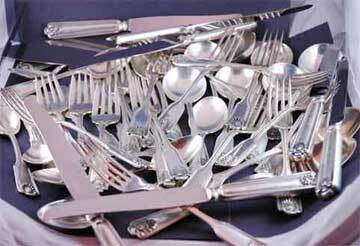 Do you know how to tell is your flatware is sterling flatware, or silver plated silverware? We buy antique silver flatware in any condition. I buy silver flatware to melt down for the silver content. How much I pay is based upon the price of scrap silver that day, less refinery fees, and a fair profit. I will happily look at your silver and give you an appraisal of it’s value. The knives, pie wedges, and other pieces will have stainless steel blades, so most of their weight is not silver. In addition many of these handles are filled with clay. Call me to get the formula I use on those items. Is My Silverware Sterling or Plated? Usually you can tell if your silverware is sterling silver by looking at the back of the spoons and forks for a Sterling Mark. If the mark is there it has a 99.9% chance of being genuine. Occasionally, we run into a Scandinavian set that is unmarked, but tests out to be genuine Sterling Silver. Usually unmarked silver is plated. Look for words like electroplated, or plated. Brands like Wm E Rogers are usually plated, as they started making plated silverware in 1847. They sold a lot of these silver plated sets as they were much cheaper than genuine sterling silverware. If your silver is marked with the number 800 it’s not sterling silverware, it is .800 silver, but it’s still valuable as it is 80% silver. Some silverware was made with melted coins. Sometimes 90% silver coins were turned into silverware. These coin silver flatware sets are also of value as they are 90% silver. 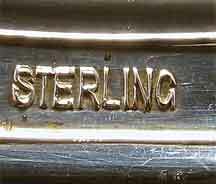 Recently some Marked Sterling silverware fakes have appeared around the country. This requires testing your silverware. I will test your silver as you watch. I’ll weigh it on a State Certified Scale and give you an immediate appraisal of your silverware’s value. I serve the communities of Prescott, Chino Valley, Prescott Valley, Camp Verde, Cottonwood, Surprise, Payson, Wickenburg, Cave Creek, Anthem, Phoenix, Wittman, and Sun City, Az. if you are in, or visiting Prescott, just stop by to sell your Sterling Silverware.